It's a bird! It's a plane! It's...remote-controlled, laser-cut foam shaped like a superhero? Known as RcSuperheroes, these 78" devices are akin to remote-controlled airplanes, but up in the sky they look remarkably like real people. They are available for $345 (US), but the kit doesn't include the motor and other hardware. These superheroes are not for novices, however. 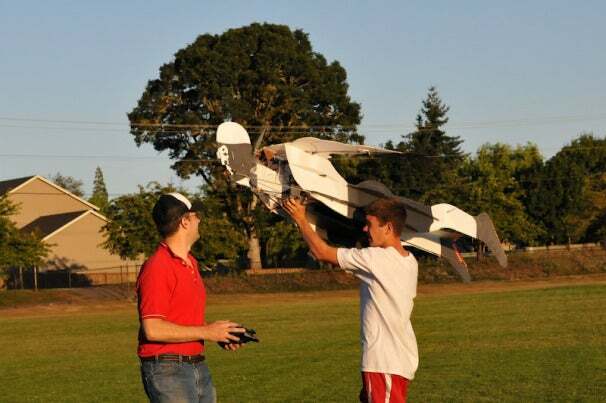 Experience assembling and flying remote-controlled airplanes is recommended. Recently, viral marketing agency Thinkmodo flew three RcSuperheroes in the skies over New York City. The goal of this stunt was to advertise the upcoming movie Chronicle, a story about three teenagers that develop superpowers, including the ability to fly. Sure enough, New Yorkers were flummoxed to see people flying around the Brooklyn Bridge and the Statue of Liberty. Check out a video of the stunt below. In addition to the fun of flying the RcSuperhero, there is endless potential for pulling pranks with these things. How many people can you convince that there is a real Iron Man?